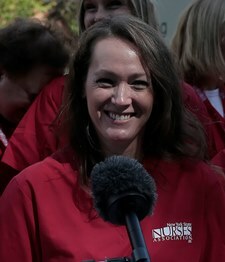 Nurses know that safe staffing levels save lives-and the research is on our side. Clinical and academic studies show that safe staffing improves patient outcomes and even saves money. 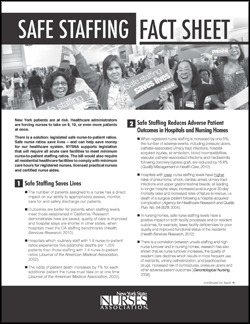 Download the Safe Staffing Fact Sheet. Hospitals that staff 1:8 nurse-to-patient ratios experience five additional deaths per 1,000 patients than a 1:4 nurse-to-patient ratio (Journal of the American Medical Association, 2002). Outcomes are better for patients when staffing levels meet those established in California, including an increase in lives saved, shorter hospital stays, and general improvement in quality care (Health Services Research, 2010). Lower ratios do not close hospitals and are cost-effective! Increased nurse staffing is a more cost-effective tactic to improve patient care when compared to other interventions (Nursing Administration Quarterly, 2011). Safe nurse staffing reduces turnover in hospitals. When ratios are blown out of proportion, there is an increase in nursing turnover and a decrease in patient satisfaction. All of this increases the cost of care (Nursing Administration Quarterly, 2011). Turnover is expensive—the average cost to replace an RN ranges from $82,000 to $88,000 (The Journal of Nursing Administration, 2008). Nurse understaffing in hospital ICU increases the risk of infections like pneumonia, which not only lead to injury and death, but also cost the hospital significant amount of money. Hospital-acquired pressure ulcers alone have been estimated to cost $8.5 billion per year (Agency for Healthcare Quality and Research Pub. No. 04-0029, 2004). Facilities have the flexibility to assign nurses fewer patients than the set ratios if appropriate. Ancillary staff remain vital to healthcare—California hospitals did not decide to cut non-nursing jobs as a result of safe staffing ratios in effort to cut costs.